Civil society groups say the EPA will not benefit either Ghana or West Africa, while the EU (photo) calls it a win-win. Ghana’s parliament has ratified the Economic Partnership Agreement (EPA) between government and the European Union (EU). Government earlier signed onto the agreement (interim) but was awaiting ratification from Parliament as stipulated in the country’s laws in relation to international agreements. The ratification of the agreement by Parliament will lead to the entry of a percentage of imports from Europe to Africa and vice versa, free of tariffs. For Ghana some of the duty-free access on exports to the EU market include processed cocoa products, fruit and vegetable products, and fish. Prior to its ratification a number of business associations as well as civil society organizations had kicked against the agreement arguing that the deal will do more harm than good for the country. But majority of exporters in Ghana had warned they will be forced to halt operations in the country if Ghana’s fails to sign onto the EPA before the October 1st, 2016 deadline. Chief Executive Officer of Thailand-based producer of seafood-based food products, Thai Union Elisabeth Fleuriot told Citi Business News that “about 2,000 people plus their families and the suppliers and so on is basically 10,000 people that we are talking about which today don’t have the feasibility of the future and don’t know what will happen to their jobs.” “Now if the 20% increase on export will happen yes, we will have to relocate the plant from Ghana to countries where it is more favorable, it might be in our network, it might be in Ivory Coast may be in Ecuador that is basically what we are looking at’. Trade and Industry Minister, Dr. Ekow Spio- Garbrah has however rejected claims that signing an interim Economic Partnership Agreement with the European Union will collapse indigenous businesses in the manufacturing sector. Speaking to Citi Business News, Dr. Spio-Garbrah rather challenged locally based manufacturers to improve the standards of their products to enable them export to the EU. “Ghanaian producers will be entering the European markets at a preferential rate. So it is not the exporters that will suffer. The EPA also expects the other counterparts to open their markets over a period of time,” he said. The Trade and Industry Ministry also believes Ghana signing onto the agreement will save the country a total of €400 million in export taxes to the European Union (EU) annually because taxes and duties that will be paid on Ghana’s exports to the EU will be scrapped following the signing of the Agreement. 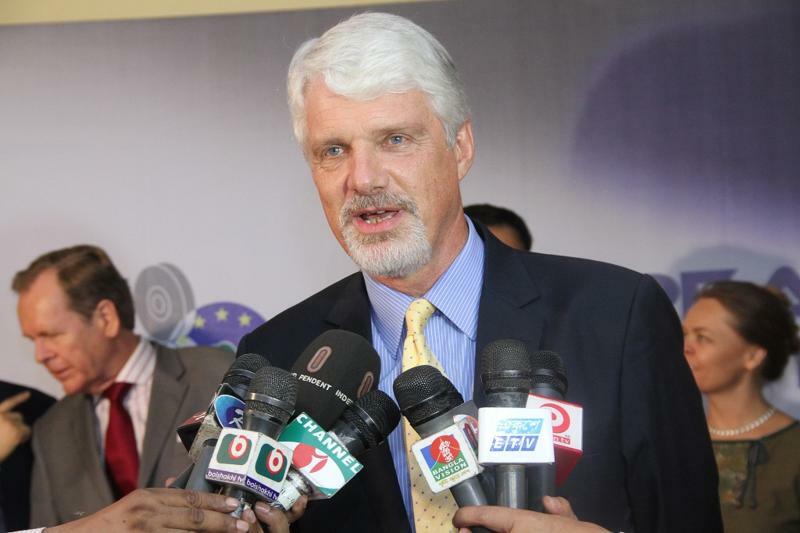 EU Ambassador to Ghana William Hanna welcoming the decision said the new agreement will provide a long term predictable framework to help increase trade and investment between the two countries. Since 2000, African, Caribbean and Pacific countries (ACP) have been working with the EU Commission to sign a non-preferential bilateral trade treaty in which either side would offer both tariffs and concession, but in a regime that favours the ACP countries more. ECOWAS member states including Ghana have been working since 2000 to sign the pact as a sub-region with the EU. In December 2007, Ghana initialed an interim EPA to avoid a similar tariff action after the preferential trade agreement enjoyed under a previous treaty , named the Cotonou Accord expired in the year 2000. Trade volume between EU and Ghana as at 2013 was estimated at 11.2 billion euros from 1.9 billion euros in 2000. Currently, the EU is Ghana’s biggest trading partner as trade volumes is further estimated to surge. Meanwhile President Mahama wants other leaders across the sub-region to sign unto the Economic Partnership Agreement on or before the October 1st deadline. According to him, it will be in the best interest of the sub-region to promote regional integration by agreeing to the EPA. “It is desirable for the sub-region to continue to work for a common EPA and despite the fact that it has become imperative for Ghana and Cote D’Ivoire to go ahead and sign the interim EPA, we will continue to work to ensure so that we bring the whole sub-region onboard so that it advances the course of our integration,” he stated.